According to the Cornell Lab of Ornithology, the oldest wild Spotted Owl on record was a female that was recaptured in 2006. Thanks to her leg band, biologists were able to identify her as a young owl that had been banded in 1988. She was estimated to be 21 years old! The Spotted Owl is one of the few owl species that has dark eyes. Most other owls have yellow or orange/red eyes. In one study that took place in the coniferous forests of Oregon, biologists discovered that over sixy percent of Northern Spotted Owl nests sites were in trees over 120 years old. 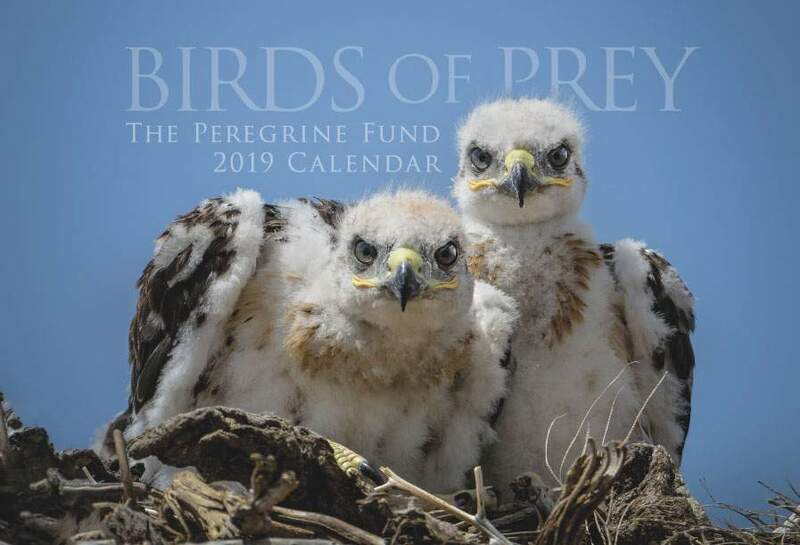 Though The Peregrine Fund doesn't work directly with Spotted Owls, our efforts in scientific research, habitat conservation, education, and community development help conserve birds of prey around the world. We also supply literature to researchers from our avian research library, which helps scientists around the world gather and share important information on raptor conservation. The Spotted Owl can only be found throughout a relatively small portion of North America. Its range is fragmented - meaning there is a geographic separation between individual populations - making it extremely difficult for them to mix or interact in any way. Its range extends along the coastal forests of southwest British Columbia, Canada and the U.S. including in California, Washington and Oregon; the mountains of the southwestern United States and central Mexico. Generally, the Spotted Owl does not migrate, however, it may travel between high and low elevations as the seasons change. This helps them access a more stable food supply all year round. There are three subspecies of the Spotted Owl: the Northern Spotted Owl, the Mexican Spotted Owl and the Calfornia Spotted Owl. According to the U.S. Fish and Wildlife Service, the Gila Wilderness, in New Mexico, is home to the largest number of Mexican Spotted Owls. Though this species' range is limited, it can actually be found in a number of different habitats. However it prefers densely-canopied forests of coniferous or hardwood trees, and old-growth forests. In fact, it is most closely associated with un-logged forests with tall trees. Other habitats include woodlands and even steep canyons. For nesting and roosting, Spotted Owls prefer areas with tall trees, often choosing habitats near streams or other waterways. Some of the tree species they are associated with include: Douglas-fir, Pacific Silver Fir, Sitka Spruce, and Redwood. The Spotted Owl is a relatively large owl. However, unlike the Great Horned Owl - which is also quite large - the Spotted Owl doesn't sport any ear tufts. It also doesn't have yellow eyes. This owl has a large round head and dark brown eyes, which contrast nicely with its yellowish bill. Though each of the three Spotted Owl sub-species varies slightly in appearance, generally speaking this owl is overall a dark brown. And, true to its name, its chest and abdomen are covered in... you guessed it... spots! Oval-shaped cream-colored spots to be exact. Its facial disk is brown with lighter markings around and in between the eyes. Like many raptors, the Spotted Owl is a top predator. This means it hunts other animals for food but few other animals hunt adult Spotted Owls on a regular basis. Usually, the only direct hunters of most top predators, or apex predators as they are also known, are humans. These predators, including the Spotted Owl, play an important role in nature by helping to control populations of prey animals and maintain a balance in the ecosystems where they live. As you might imagine, top predators can be very skilled hunters. The Spotted Owl is no exception. One way in which it locates and captures prey is through its amazing ability to hear and pinpoint sounds. But, how does it do this? The Spotted Owl, like other owls, has asymmetrical ear openings. This means that one ear opening is located higher up on one side of the head, while the other ear opening is located lower on the other side of the head. There can also be one ear opening that is a bit farther forward on the head while the ear opening on the other side of the head is a bit farther back. The ear positions can be any combination of high, low, forward, and back! This helps owls better triangulate sounds, thus making finding prey that much easier. Because of its expertise at hunting, and moments of high prey abundance, the Spotted Owl sometimes catches more food than it can eat in one sitting. When this happens, it stores its extra food just like we do. Well... not exactly like we do. Of course Spotted Owls don't have refrigerators and they certainly don't use tupperware or tinfoil. But, it will save or cache its food in a safe spot that is relatively cool - such as under moss on a tree limb, or under logs or rocks. When the owl feels hungry again it will fetch the stored food for a quick and reliable meal. Over the years, the Spotted Owl has been the center of a lot of controversy! Some groups and invididuals used this lovely owl as an unwitting symbol in the battle against logging in old growth and mature forests. This caused some resentment toward this species among certain groups. However, because this owl requires mature forests in which to nest and roost, loss of these habitats does have a detrimental affect on its abililty to survive. The Spotted Owl was awarded federal protection in 1990, but to this day it is still suffering a marked decline in population numbers. 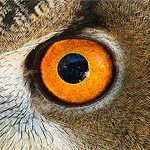 According to Defenders of Wildlife, "there are fewer than 100 pairs of Northern spotted owls in British Columbia, Canada; 1,200 pairs in Oregon, 560 pairs in northern California and 500 pairs in the state of Washington." Unfortunately, habitat loss isn't the only threat the Spotted Owl has to contend with. It is actually under threat because of another owl! The larger and often more aggressive Barred Owl has been slowly encroaching on, or moving in to the Spotted Owl's territory. If enough of them move in, they can outcompete and displace the smaller Spotted Owls. Though adult Spotted Owls aren't normally considered prey, they may be taken occassionally be a Great-horned Owl or even a Red-tailed Hawk or a Golden Eagle. Their eggs and young birds might get eaten by a number of different predators including other crows and some medium-sized mammals, like the fisher. The Spotted Owl is considered endangered in Canada and threatened in the United States. Like many other predators, the Spotted Owl is an opportunistic feeder - meaning if it has the means and opportunity to catch something, it will eat it. Though these owls show a decided preference for small mammals, such as flying squirrels, wood rats, rabbits, hares, mice, and voles - they will certainly take down other prey including birds - such as jays, passerines, woodpeckers and even smaller owls! They will also prey on amphibians and reptiles - though with less frequency - and insects. The Spotted Owl is a nocturnal hunter and often sits in wait on a perch as it searches for its dinner. Once a tantalizing morsel is found, it will swoop down from its perch catching its prey with needle sharp talons. Like most other owls, The Spotted Owl is a silent hunter that uses its keen eyesight and hearing to locate and capture prey. Like other owls, and some other raptors, Spotted Owls are equipped with a facial disk, a group of feathers around their heads that helps direct sound to their ears. To get an idea of how it works, cup your hands behind your ears and listen – sounds will be louder and clearer. Owls can raise these feathers slightly when on the hunt, allowing them to hear the rustle of a mouse in the grass, the flapping of feathers in the night, or the scuttle of an insect running along a tree branch. These sounds give away the location of prey animals, making it easy for these owls to deftly swoop in to catch a meal. Spotted Owls, like many other owl species, will swallow smaller prey items, such as rats, whole! When an owl does swallow its prey whole - it swallows everything - bones,teeth, tails, claws, fur and feathers. As you can imagine, some of these items might be difficult to digest - even for an owl. All those undigestable bits are regurgitated in the form of a pellet. The pellet is oblong in shape and usually covered with the undigested fur or feathers. Inside the pellet, bones, teeth and claws can be found. In fact, in some owl pellets scientists (and students, too) have been able to find the entire skeleton of the owl's prey! Similar to many owl species, the Spotted Owl does not build its own nest. The female might make a scrape within the chosen nesting site or perhaps add a few feathers, but that's about it. This species most often chooses to lay its eggs in a tree or snag with a natural cavity - formed by a broken limb or top - usually opting for forests with dense canopies for nesting sites. In areas where not a lot of trees can be found, it might nest on cliff ledges or within caves. Like the Long-eared Owl, it might also use an abandoned stick nest built by other birds, such as raptors or crows, or even squirrels. It might also use mistletoe tangles as nest sites. Scientists believe Spotted Owls are monogamous - meaning the same pair stays together for life. They tend to re-use the same nest over and over during each new breeding season, though individual pairs do not necessarily breed every year. Before breeding begins, the male and female will display some pre-laying behavior. They can be seen preening each other and roosting together. Once the time is right, the female will lay her eggs. She usually lays between 2 to 4 smooth, whitish eggs, which she is in charge of incubating. While she is busy keeping her eggs safe and warm, it is the male's job to search for and bring back enough food to feed himself and his entire family. Incubation usually lasts around one month - and then it is time for the fluffy white nestlings to hatch. 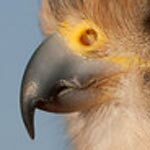 When the nestlings hatch, they are covered in soft white down and their eyes are closed. They are 100% dependent on their parents for food and protection. However, these young birds will grow quickly. They will begin moving out of the nest at only around 5 weeks of age! They will engage in a behavior known as "branching." Before they are ready to fly, they will begin to explore the area around their nest, climbing on tree limbs and scrambling up branches. They will often flap their wings vigorously and make short hops from branch to branch as they build up their flying skills. Like many young raptors, their first flights are often awkward and their landings can be even worse! They might crash into trees or end up hanging upside down as they cling to a twig, before righting themselves again. At about 6 weeks of age, the young owlets learn to fly. Soon, they will be just as agile and skilled as their parents, however, they will still be dependent on their parents. They will remain in their parents' territory for up to three more months as they learn to survive on their own. Once they are ready, they will disperse in search of their own territory and their own mate. The World Center for Birds of Prey offers fun ways to learn about birds of prey. Interactive exhibits, tours, interesting videos and a children's room with activities from coloring sheets to quizzes to costumes are all available. Owls are included among the ambassador birds at the visitor center, providing visitors with a wonderful opportunity to see owls up close and learn about the wonderful and interesting adaptations they have in order to survive in their respective habitats. There is also a touch table with owl feathers and other natural objects available for exploration.